Genre: Fairy-tale Retelling, Fantasy, Action-Adventure. “Snow White, imprisoned daughter of the late king, escapes just as the Magic Mirror declares her the source of the Evil Queen’s immortality. The Queen sends her men, led by a local huntsman to bring her back. But upon her capture, the huntsman finds he’s being played and turns against the Queens men, saving Snow White in the process. Meanwhile, Snow’s childhood friend, William, learns that she is alive and sets off to save her.” Retrieved from IMDB. Based off of IMDB, it looks like much of it was filmed in Scotland and various other locations in England. Angelina Jolie and Winona Ryder were considered to play the evil queen Ravenna, but Charlize Theron took the role after dropping out of J. Edgar to do it! Johnny Depp, Tom Hardy, Viggo Mortensen, and Hugh Jackman were all considered for the role of The Huntsman. Might I say that I am SO GLAD that Chris Hemsworth won out. So glad. Dakota Fanning, Selena Gomez, and Lily Collins all were considered for Snow White. After Lily Collins lost the role to Kristen Stewart, she took the role in Mirror Mirror. During filming, Kristen Stewart actually punched Chris Hemsworth in the face and gave him a black eye. I believe they actually talk about this on the “Unscripted” interview of the three main co-stars, Charlize, Chris, and Kristen. See it here. Kristen Stewart stated that she had to get over her fear of horses that she has had since nine-years-old to film the fight scenes in the movie. 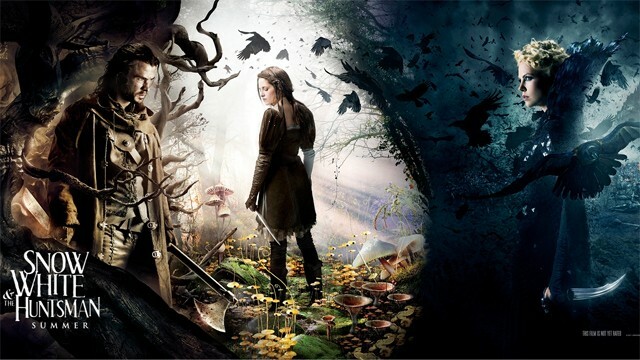 I decided to do a movie review of Snow White and the Huntsman, since it somewhat pertains to our focus on mostly YA fiction, since it is a fairy tale we all know and love! On to the movie.. The special effects were quite awesome. The soilders who broke apart like glass on the big screen was spectacular. The fire and action sequences were realistic, and in my opinion, worth the movie ticket purchase. The plot itself was very different from the Disney version. I didn’t know what was coming and was pleasantly surprised by this. I went into the movie fearing that I could predict the whole movie, but it was apart from it enough that I couldn’t. There were, of course a few predictable scenes such as the mirror, apple, and kiss, but all were done with a twist. I have to say that I really enjoyed the movie’s version of the mirror! Also, the dark forest scene was so creepy, I was cringing in my seat. The acting wasn’t oscar-worthy, but it was believable and I would say just great, but nothing more. Kristen Stewart played her part of growing from an imprisoned girl to a passionate leader was great while Charlize was uber-creepy and scary mean. Chris’s role as the broken warrior was heartfelt and honest. Honestly, Kristen Stewart isn’t exactly the most beautiful black-haired beauty that I can think of and doesn’t exactly pop into my mind when I think of fair snow white, but this was also portrayed different in the movie. The “beauty” was more focused inward with the powers of life she possessed and her general pursuit of all that is good. You see this a little bit in the Disney versions, with Snow White’s kind and caring nature, but it is much more the focus in this version. The romance in the story of snow white is not in the focus at all. I would not consider this a “romance” at all, per say, but an action-drama that includes it. The romance is much different than the Disney story, and I loved it! I thoroughly enjoyed that the focus was on the love Snow White possessed for her people. Just don’t go into this movie expecting an epic love story between Snow White and whomever, because that is not the focus of this movie. There is a particular scene that made me cry in this movie. To me, it was an epic speech, but to my boyfriend it was corny. He looked at me and rolled my eyes, but I don’t care. I loved it. The ending of the movie was very powerful. I recommend this movie to anyone who can go into it with a clear and open mind, away from Twilight. If you don’t want to see it for the same reasons as my boyfriend, at least (ladies), see it for Chris Hemsworth. Yum. I have never watched Twilight, so had to use Google to remind me just who Kristen Stewart is. Even after looking at her pictures, I still don’t recognise her. I have seen Panic Room, but she was only 12 or so in it. You are from the US, I take it? I live in England, and Scottish people smell. I reckon this film smells. Thanks for this review! I want to see the movie since I love fairy tales but was wondering whether or not it would be good. 5 stars! I want to go see this but now I need to go. 🙂 Great review! I absolutely loved this movie! I must admit though, that I am a Krisbian and a Twihard and a certified Robsten fan.. lol.. Anyways, I love this movie not just because I am a crazy fan of Kristen but because the movie was simply amazing, though the dialogues could have been better but the acting, plot, special effects and the chemistry of the whole cast made up for it. I definitely adore how this movie showed that Kristen can play other roles besides Bella. She’s not just the girl from Twilight anymore..
BTW, thanks for following my blog! I’m still figuring out how to follow yours.. Thanks Krishna! There is a spot to follow by email at the bottom of the page. Also, you can follow if you use the wordpress reader as well at the top, if you are logged in to wordpress.com. You are right, she is not. This being said, I want to see this movie for the visual effects mostly, but 2 hours watching Kristen make (un)funny faces might be just too much. (No I am not a ‘Twilight’ hater, I even quite liked the book back then, but I so don’t like that actress. I saw her in ‘Speak’ though and I liked that movie, so maybe, just maybe I can ignore her in this one and get to enjoy it).